What ICT options can be utilized to characterize drivers of environmental degradation and to devise robust approaches to monitor and address them? 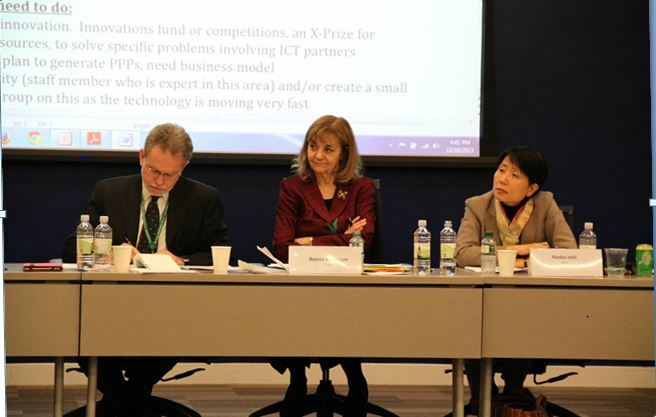 Who can build effective partnerships with the GEF to advance the use of ICT and how can such partnerships be developed? How can ICT help measuring short term results and long term impacts? What ICT tools can guide priority setting processes? A select group of experts from various sectors of society were gathered to help answer these questions. In addition to members of the STAP and GEF Secretariat, participants included, inter alia, private sector representatives such as IBM, AECOM, Arup, Hitachi, CISCO and Amazon; public sector and academic representatives such as the White House- Office of Science and Technology/Policy, USEPA, Stanford University, The World Bank, UNDP, and UNIDO; as well as civil society representatives such as World Resources Institute (WRI), Conservation International and The Nature Conservancy (TNC). Participants were given the opportunity to form breakout discussion groups on the topics of Smarter Cities, Food and Agriculture, Forests and Land Use, and Data for Institutional Decision-making. Each working group came back to the Plenary with preliminary ideas for the incorporation of ICT into GEF-6 work within the assigned topic areas. A summary report of the Forum will be published shortly and made available on this website. In the meantime, background information about the Forum can be found here, and the agenda can be found here.